Coleman Xtreme® coolers are designed to keep large volumes of food and drink cool and fresh. Packed with innovative features including hinged lids, beverage holders and two-way handles these ergonomically designed coolers are perfect for a family at the campsite or for larger groups at events. Xtreme® coolers coolers are rugged and in it for the long haul, so are ideal companions should a party run a little longer than intended. Unlike other manufacturers, Coleman rigid coolers are insulated with Polyurethane insulation (PU). PU is a very dense and an excellent insulator filling the entire internal cavity of the cooler, leaving no air gaps and so improving its insulating efficiency. Extensive testing at Coleman has shown that cooling loss from rigid coolers is 30% through the top and also 30% through the base. Coleman's latest models feature increased insulation in these particular areas together with reduced insulation on the sides. The result of these changes is not only improved cooling performance but the reduction in exterior dimensions and the increase in internal volume. When a cooler comes in contact with a warm floor, heat is transferred directly from the floor to the cooler and reduces the cooler's efficiency. 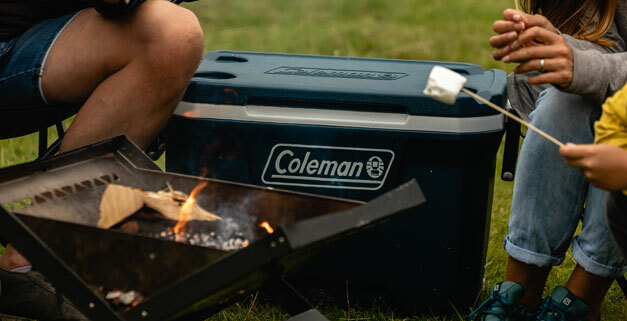 Coleman has included shaped feet into the design of its newer rigid cooler models separating the cooler base from the floor and increasing airflow. This flow of air acts as an additional form of insulation, slowing the transfer of heat from the floor and so improving the coolers performance. Additional research has also resulted in the rounding of the cooler’s corners, once again this change of shape has increased airflow and further enhanced their performance.